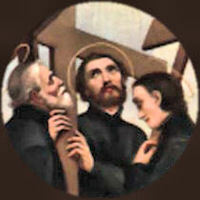 God our Father, source of strength for all your saints, you led Paul Miki and his companions through the suffering of the cross to the joy of eternal life. May their prayers give us the courage to be loyal until death in professing our faith. We ask this through our Lord Jesus Christ, your Son, who lives and reigns with you and the Holy Spirit, one God, for ever and ever. Amen. Paul Miki, a Japanese Jesuit, and his twenty-five companions were martyred in Nagasaki, Japan. They were the first martyrs of East Asia to be canonized. They were killed simultaneouly by being raised on crosses and then stabbed with spears. Their executioners were astounded upon seeing their joy at being associated to the Passion of Christ. Before the reform of the General Roman Calendar today was the feast of St. Titus, whose feast is now combined with St. Timothy on January 26 and St. Dorothy, virgin and martyr whose feast is no longer on the Universal Calendar. Nagasaki, Japan, is familiar to Americans as the city on which the second atomic bomb was dropped, killing hundreds of thousands. Three and a half centuries before, twenty-six martyrs of Japan were crucified on a hill, now known as the Holy Mountain, overlooking Nagasaki. Among them were priests, brothers and laymen, Franciscans, Jesuits and members of the Secular Franciscan Order; there were catechists, doctors, simple artisans and servants, old men and innocent children—all united in a common faith and love for Jesus and his church. Brother Paul Miki, a Jesuit and a native of Japan, has become the best known among the martyrs of Japan. While hanging upon a cross Paul Miki preached to the people gathered for the execution: "The sentence of judgment says these men came to Japan from the Philippines, but I did not come from any other country. I am a true Japanese. The only reason for my being killed is that I have taught the doctrine of Christ. I certainly did teach the doctrine of Christ. I thank God it is for this reason I die. I believe that I am telling only the truth before I die. I know you believe me and I want to say to you all once again: Ask Christ to help you to become happy. I obey Christ. After Christ's example I forgive my persecutors. I do not hate them. I ask God to have pity on all, and I hope my blood will fall on my fellow men as a fruitful rain." The survival of Japanese Catholicism is one of the most moving stories in the entire history of the Church. For over two centuries the people had no priests but lived the faith as best they could, in secret, not daring to keep written materials but handing down their beliefs by word of mouth. (James Hitchcock, The Nagasaki Martyrs) You can read more in this article from Catholic Culture's Library, The Nagasaki Martyrs. Stop for a moment today to pray for Christians who are persecuted throughout the world. Read more about St. Paul Miki and Companions at these websites: St. Paul Miki; or view this video St. Paul Miki's Martyrdom. Read Pope Pius XII's Encyclical Meminissee Iuvat on prayers for the persecuted Church. St. Dorothy, (i.e., the gift of God), a virgin from Caesarea in Cappadocia, allegedly suffered a martyr's death under Diocletian. Her relics are honored in a church dedicated to her honor in the Trastevere section of Rome. (On the door of St. Dorothy's Church the names of those who had not received holy Communion during Easter time used to be posted.) Her feast was introduced into the Roman calendar during the Middle Ages. A very edifying story is related in connection with her name. As Dorothy was being led to execution because of her faith in Christ, she prayed, "I thank You, O Lover of souls, for having called me to Your paradise." A certain Theophilus, an official of the Roman governor, jestingly retorted, "Farewell, bride of Christ, send me apples or roses from your Bridegroom's garden of bliss." Dorothy answered, "I most certainly will." While devoting herself to prayer during the few moments permitted before receiving the death stroke, she beheld a vision of a beautiful youth who carried three apples and three roses in a napkin. She said to him, "I implore you to take these to Theophilus." Soon the sword severed her neck, and her soul returned to God. As Theophilus was mockingly telling his friend of Dorothy's promise, a young man stood before him holding a linen in which were wrapped three beautiful apples and three magnificent roses. "See, the virgin Dorothy sends you these from the garden of her Bridegroom, even as she promised you." Highly astonished, for it was February and everything in nature was frozen, Theophilus received the gifts and cried out: "Truly indeed, Christ is God." And soon he too died a martyr's death for publicly confessing the faith. Patron: Brewers; brides; florists; gardeners; midwives; newlyweds. Symbols: Crowned with flowers and surrounded by stars as she kneels before the executioner; crowned with palm and flower basket; surrounded by stars; crowned; carrying a flower basket; in an orchard with the Christ-child in an apple tree; leading the Christ-child by the hand; maiden carrying a basket of fruit and flowers, especially roses; roses; veiled with flowers in her lap; veiled; holding apples from heaven on a branch; with a basket of fruit and the Christ-child riding a hobby horse; with an angel and wreath of flowers; with an angel carrying a basket of flowers. Read the Golden Legend account of the Life of St. Dorothy. Decorate your table with red roses and a bowl of apples, and tell the story of Theophilus and Saint Dorothy to your family at dinner.